I hope you're planning on having a fabulous Mexican feast tomorrow in honor of Cinco de Mayo. If you DON'T know what to make, I highly recommend establishing your own family tradition - tacos! Most families seem to have a default menu item they go to when the "cook" doesn't want to think about what to make for dinner. The options range from spaghetti, to meat loaf, to chicken, to breakfast for dinner. Growing up in my family meant the "go to" meal was tacos. For years I lived under the assumption that everyone cooked up tacos like my mom. However, when I moved to Atlanta, I discovered that what was commonplace for me was more unusual for others. This is not a fancy meal, but there are a few important twists that make the preparation a big departure from your average taco. First step, brown the meat with the chorizo, onion, and garlic (if you're using fresh). When the meat is thoroughly cooked, drain off the fat and add the spices along with 1/4 cup (ish) of water. The water helps spread the spices evenly through the meat. Simmer until the water is absorbed. For my 8-inch pan, that's a little under a cup of oil. No need to measure - look for the float! Preheat your oil so you see little air bubbles forming. 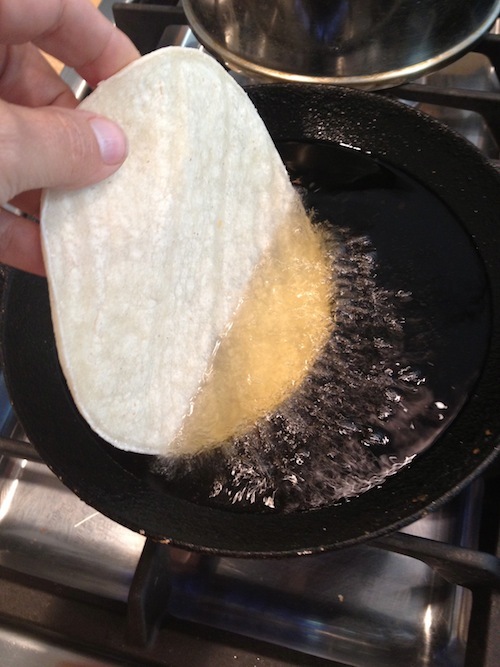 When the oil looks hot, slide a tortilla in.Let the tortilla cook until bubbles start to form on the top of the shell, then flip the tortilla.Careful when flipping! Allow the second side to bubble up as well. 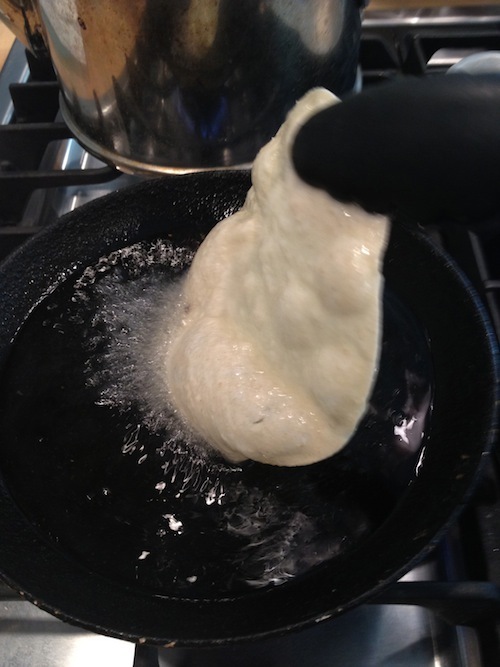 I don't like super crisp shells, so I make the flips at the first sign of bubbling. You should play with the timing until you get the shells exactly the way you like them. Before pulling the shell out of the oil, fold over and let it cook 10-20 seconds longer (again, depending on how crisp you like your shell. )Drain off of oil from the shell. Place on a paper towel and dab with another paper towel to remove excess oil. After laying out a row of 4 shells, I put another towel on top and start the whole process again. Typically I make 12-16 shells for a pound or so of meat. Now serve it up with assorted toppings. We love homemade salsa, ceviche, guacamole, grated cheese, chopped onions, lettuce, and tomatoes! Muy Bueno!! !